I apologize for writing about writing again, but I’m having a moment. A moment of feeling crushed by Friday folders filled with requests – money for the art fundraiser, canned goods for the food drive, volunteer hours for the PTO, donations for the fall festival – and workload stresses for my professor husband, and soccer and swim tournaments, and party planning and gift triage (wish-list management, shopping, ordering, returning) for both kids’ upcoming birthdays smack in the middle of holiday season, and endless requests of “Mom, can I have a pear? Mom can I have a bandaid? Mom will you take me to Target? Mom, can you cut this tag? Mom, what’s for snack? For lunch? For dinner? Mom, can I have a piece of Halloween candy?” all piled on top of all the normal everyday demands of laundry and groceries and cooking and cleaning and ironing and play-date scheduling and initialing homework and driving to sports, and everyone wanting and needing and requesting, including me wanting for myself – I want to write – and I’ve got nothing left to give. To anyone. Anymore. In the face of this, I’m having a moment. A moment of I can’t do it all. I can’t write and do everything else. I can’t fulfill my role of supporter with any kind of grace while also dedicating fully to my “writing career.” As I develop my skill set and hone my craft, I want to go deeper, but as CEO of the household, I have to pull back. And if I can’t go in all the way, I figure why go in at all. I was thinking this way, thinking of giving up, thinking “I’m silly for even considering myself a writer, of saying I’m working towards a ‘writing career’ – it’s not a career if nobody’s paying me!” when I heard Angela Duckworth speak in a recent episode of the TED Radio Hour. The episode’s title? Success. Grit. A favorite word. It’s in my lexicon. Grit is the disposition to pursue very long-term goals with passion and perseverance. And I want to emphasize the stamina quality of grit. Grit is sticking with things over the long-term and then working very hard at it. My husband and I have talked about this before, that it seems that talent and aptitude do not guarantee success. Though I feel he has both in spades, when everyone in our families made a big deal about his PhD, he downplayed his talents, claiming the degree was not an indicator of intellect. It merely indicated that he had endured. He had a career goal, and the PhD was required to achieve that goal, and so he just kept going until it was done. He didn’t give up, even when it was really, really hard. The same was true for me with distance bike rides and triathlons. I’m no athlete. Phys Ed class brought down my GPA in high school. But as a young adult, when I committed to the AIDS Ride, to raising $2000 and riding my bicycle from North Carolina to Washington DC, I didn’t give up. I didn’t complete the 330 miles at the front of the pack, but athlete or not, I started, and I didn’t quit, and so I finished. And when you start something, and you don’t quit? You finish. You succeed. I have the same passion for writing as I did for those athletic events, only I don’t have as much time to dedicate as I’d like. I’m chomping at the bit. I want to take it to the next level. I want to write and write and write, I want to spend 3 or 4 hours a day writing, I want to pursue ideas that require concentration and focus, I want to run with it. But I also want to be Mom, and I can’t do them both and do them both well, and that makes it really, really hard. It makes me want to say I can’t run with this, what’s the use, this isn’t working, I am Mom, not writer, I quit. I’ve completed an Olympic distance triathlon. I’ve birthed two babies without painkillers. I’ve been a stay at home mom for ten years and have not thrown a child or myself out a window. I can do slow and steady. I can endure. When host Guy Raz asked about how we might build perseverance, Duckworth replied, “believing that change is possible inclined kids to be grittier.” By knowing that change is possible we can believe that persistence will pay, we can acquire grit, we will recognize that even when failure seems eminent, we can succeed on the other side because failure is not a permanent condition. I know change is possible. I know that every situation is temporary, including these Mom years, when our kids are young, and they need me. 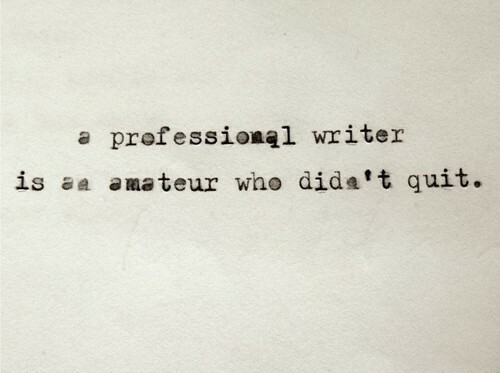 My perceived failure as a writer is not a permanent condition. The moment I’m having? The one I mentioned in the lead of this post? It will pass. In fact, in the time since I began drafting this piece on Saturday morning, and now, as I finish it up on Sunday evening, it already has. Change has already occurred. I no longer feel like quitting. And as for the sprinting? I don’t need to race. I want out of the gate, but I can keep warming up for a while first. I can do slow and steady. I can endure. One day, maybe ten years from now, maybe fifteen, I will get to the point where I no longer feel the need to put quotes around my “writing career.” I’m gritty, damn it. I will succeed. How gritty are you? Take Duckworth’s test here to find your grit score. Great post, Andrea! You don’t need “quotes” now. You are a writer. Writing to you from the far end of the mom spectrum, obstacles will always remain, and you’ll just keep getting your gritty on to overcome them. Thanks for perspective from the future, Judy. Gettin’ my gritty on. Thanks for this – I needed the reminder. Grit is a good word, but I like sticktoittiveness too. =) It is what my father always said I lack, but it is what twenty years of rejection letters says I have, in spades. Yes ma’am, you do!! 20 years of sticktoitiveness – that’s some moxie there. Thank you for the inspiration. YES to Grit, capital G. Check out the book Talent Is Overrated — a nonfiction book about the difference between the “greats” and the “pretty goods” and “I quit when I turned 14″s — there is definitely a link between temperament and “success” (tho these days, I’m re-examining my definition of success — not sure the popular culture’s interpretation fits me very well) … and it has a lot to do with being able to endure practice of whatever kind, and to practice effectively — which means being able to withstand being in the uncomfortable space of doing something not very well — an unpleasant sensation … anyway. Glad your moment changed from overwhelmed. I think you hit the nail on the head – we have to define what success means to us before we can decide whether or not we have succeeded. I love your thoughts, that success may be the practice itself – “to endure practice of whatever kind… — which means being able to withstand being in the uncomfortable space of doing something not very well. Perfectly put. When I write about future success, I’m still working on what that means for me, but I think mostly it means I produce work that I’m really, really proud of. I guess in that sense I have already succeeded. So maybe my future success means that by the time the kids move out, I will be skilled enough as a writer to supplement our income through my craft rather than going out and getting some other kind of job. I think that’s probably my definition of success for myself. Thank you so much for posting this. It was exactly what I, personally, needed to hear. Life constantly gets in the way of life, doesn’t it? And sometimes we falter because we doubt our own abilities. But a little grit can go a long way and a lot will get you exactly where you want to be. We can do it! Life does have a messy way of getting in the way of itself! And I love that you point out that we falter because of self-doubt. I think you’ve hit a key point there. Success isn’t always clean, and as Lesley mentioned in her comment above, we sometimes have to “withstand being in the uncomfortable space of doing something not very well” before we become better. And that’s when we doubt ourselves, and that’s where the grit comes in. I’m glad this was helpful to you, as your comment about doubting ourselves was helpful to me too. We can totally do it. I know! It’s genius. It says everything we need to know. I remember the first time I really got that slogan – maybe during the AIDS Ride? – and realized the power of it. No thinking, no worrying, no hemming and hawing. Just do it. Seth Godin recently wrote a post about the difference between “persistence” (which if often touted as a good trait although, as he points out, it’s more applicable to telemarketers than, for example, Olympic athletes) and “tenacity.” I like “gritty,” but I also like “tenacity” – that sense of hanging on and sticking with it no matter what it takes. That’s what a writer needs, because writing is about the long haul. There are no short cuts. Tenacity – yes! Perfect word. I wish we lived in the same town so we could have coffee, Jamie. I think we could spend a lot of time talking. Love your closing: “Your life influences your writing influences your life influences your writing. And so it goes” Yes ma’am. Thank you. Grit is a word I’ll have to remember. Hadn’t heard it in a while. I think you can definitely call yourself a writer. Good things take time and there’s nothing wrong with it. Stick with it and you’ll do more with your writing. You’ll never regret spending the time you do in your kid’s lives now, so just write as you can. They’ll be grown too quickly and you’ll have probably too much time on your hands way too soon. Previous Previous post: The best podcasts on the – airwaves? Next Next post: Thanks Forrest. Now I miss seafood.